Connect an SD card with the Player. Go to your OnSign TV account and click on the “Players” tab. Select the Player to which you have connected the external storage. Select “Settings” from the menu on the left. 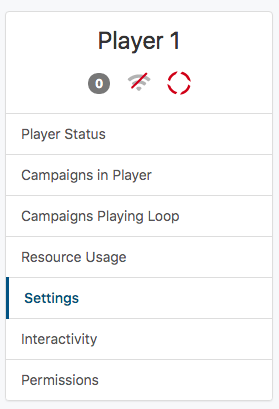 On the next page, scroll down to "Player Settings", then click “Use External Storage” at the “Storage Settings” topic. As you click, the field “External Storage Path” will appear right below. If you don't know your external path, as this varies for each device, refer to this tutorial. If you use the Samsung Smart Signage Platform (SSSP), use /dtv/usb/auto as your storage path. Finish with “Save” at the bottom of the page.